If you named any 28 page stapled floppy I'll bet you're wrong. I only recently realized my first comic was also a beloved children's book. I'm talking about the classic THE MONSTER AT THE END OF THIS BOOK. Grover's literary opus is actually a meta head-trip of a comic book (and not just thanks to the vintage 70's art and typography). Here we have Grover breaking the fourth wall and talking directly to the kids. Oh sure this has been done before in comics and it's standard operating procedure for Sesame Street. But Grover takes it to the next level. By simply turning the pages the kids themselves are breaking the wall (sometimes quite literally) and having a direct effect on the plot. 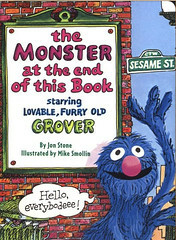 Grover's interaction with the reader is the story. Could this have been done so well in any other medium? No way, I sez! The comics style - the word balloons and immediacy of the panel progression (in this case the panels are all two page spreads) - provide maximum intimacy between reader and character. It's a form of comics that still infiltrates childrens' picture books today. Ethan Long follows Grover's lead in his popular 2004 book TICKLE THE DUCK. 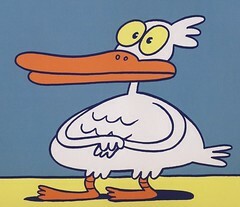 In it the reader propels the story by tickling Duck's bumpy feet or hairy armpit causing him to break out in hysterical laughter after each page progression. DUCK utilizes all the same strengths as MONSTER plus it successfully adds the touch-and-feel gimmick. Ironically the direct sequel to MONSTER misses the point of the original. ANOTHER MONSTER AT THE END OF THIS BOOK adds that rock star Elmo to the mix (apparently not satisfied with co-opting half of Sesame Street, he must also insinuate himself on his costars' past achievements) while replicating the look of the original. 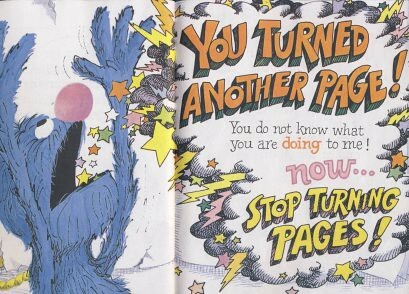 This time Grover is pleading with Elmo not to turn the page, leaving the reader to merely observe the action. This takes a lot of fun out of the original premise. The duck also has his own follow-up book called STOP KISSING ME (or more accurately, STOP SEXUALLY HARASSING THE POODLE). Like the Elmo version, STOP KISSING ME brings another character into the story. The reader still gets to push a button and produce a cool slobbery kiss sound effect whenever Duck smooches the poodle, but this kind of involvement isn't as direct. In TICKLE the reader gets to "control" the action. With KISS it's more of a Rocky Horror brand of audience participation. According to Long's website there's a third Duck book on the way that apparently involves a working light switch. The advancements in touch-and-feel technology are accelerating at a remarkable rate! At any rate, both Duck books are worth your while. Aside from laying the groundwork for brainwashing your children, they also happen to be a lot of fun. And dude, that duck's face cracks me up. You don't need me to tell you that THE MONSTER AT THE END OF THIS BOOK is worth your while. I'll just assume that if you're reading this you own it already. Right? But don't bother with ANOTHER MONSTER because - You know what? - screw Elmo. Such an attention whore.